Isolated by its Gulf neighbors and sidelined by its American strategic partner, Qatar’s vulnerability in the early stages of the Saudi-led diplomatic boycott could hardly have been greater. Despite the presence of 10,000 American troops on its soil, President Trump’s denouncement of Qatar’s foreign policy cast doubts on the United States’ continued support should the situation have further escalated. The Turkish parliament’s decision to permit the deployment of troops to Qatar thus constituted a major turning point, with the presence of foreign troops committed to defending the peninsula turning the tables. At a time when Turkey is aiming to expand its sphere of political-military influence through forward basing, the troop deployment will boost its ability to both project force and wield influence in the broader Middle East, all the while reaffirming one of Ankara’s key regional alliances. Second only to the American garrison at al-Udaid, Qatar will benefit from hosting a Turkish brigade-level force, the presence of which is a cornerstone of its long-term strategy to ensure regime security. But such boldness comes at a cost. The establishment of the Turkish forward base may not bind Ankara to defending Doha, but has shaken surrounding states regardless. While Qataris have welcomed the arrival of Turkish troops, news agencies and social media across Saudi Arabia, the United Arab Emirates (UAE) and Egypt have been aflame with criticism for what is perceived as unwarranted interference in Arab affairs. The backlash is such that the removal of Turkish troops from Qatar had figured on the (initial) list of demands sent by the boycotting states to Doha, which has since been retracted. The Turkish administration has not shied from denouncing the UAE’s actions, but will strive to maintain cordial relations with Saudi Arabia. Although how the crisis will play out remains to be seen, there is little doubt that the repercussions of the Turkish troop deployment will be felt for years to come. An understanding of US defense policy is required to fully grasp the key geostrategic importance of Turkey’s troop deployment. The US Armed Forces are designed to address the needs of a superpower that pursues global influence. Thus, under the Unified Command Plan, six out of nine US combatant commands are organized on a geographic basis. One such geographic combatant command is the Central Command (CENTCOM), whose area of responsibility (AOR) ranges from the Middle East to Central Asia. The Command oversaw Operation Inherent Resolve to fight Islamic State (IS) in Iraq and Syria. Although CENTCOM has its headquarters in Florida, it operates through forward deployed Component Commands. Two of CENTCOM’s five Component Commands, overseeing air force and special operations forces, are based in Qatar, rendering the US’ presence on the peninsula a fulcrum of America’s’ military footprint in the Middle East.For detailed info about the CENTCOM, see the official website, http://www.centcom.mil, Accessed on: 10 July 2017.From a strategic standpoint, these are the CENTCOM AOR’s most critical assets in the fight against IS. As a result, Qatar remains a key operational hub for the US Central Command (CENTCOM). Washington and Doha signed a defense cooperation agreement (DCA) back in 1992. Since, US-Qatar defense ties have continued to deepen, the DCA being renewed in 2013. The agreement is classified, but its importance can be gleaned from the fact that around 10,000 US troops are currently deployed in Qatar. The US forward military presence in this small Gulf state is centered on a strong air force contingent in the al-Udaid base.For a detailed assessment, see: Kenneth Katzman. Qatar: Governance Security and US Foreign Policy, Congressional Research Service, 2017.The facility also boasts impressive infrastructure that enables the operation of B-52 Stratofortress long-range strategic bombers. Finally, it is also reported that the US Army elements under the CENTCOM enjoys a brigade-level forward deployment of armor in As Sayliyah Army Base.Ibid. Doha’s defense capabilities are modest. According to open-source estimates, the Qatari Armed Forces’ active personnel number around 11,800 – barely the equivalent of a standard division.IISS, Military Balance 2017, Routledge, London, 2017.Qatar’s small population leaves it two ways of enhancing its national defense capacity: building military alliances and investing in higher-end weaponry. As an essential pillar of Doha’s ability to cooperate militarily with its allies, the US base shows that Qatar is committed to pursuing this strategy. At present, the Turkish base is expected to further diversify Qatar’s capacity as a host-nation. The US’ use of al-Udaid’s role as a strategic hub demonstrates the potential that Qatar could offer to the Turkish Armed Forces. On June 7th 2017, through a fast-track legislative session, the Turkish parliament ratified a bilateral defense bill previously signed with Qatar.Anadolu Agency, http://aa.com.tr/en/middle-east/turkish-parliament-ratifies-qatar-military-deals/836771, Accessed on: 22 June 2017.This was the most significant and tangible move made by Ankara amidst the Gulf crisis. It remains to be seen how Ankara will set the agenda for the deployment of a brigade-level force to the troubled Gulf nation. In fact, proceedings of a session held by the Turkish parliament’s Foreign Affairs Committee suggests that the initial plan is to first establish a 500-600 string contingent in Qatar, and then to upgrade it into a joint tactical division headquarters which would be headed by a two-star Qatari general and a Turkish brigadier general as the deputy commander. It was also reported that some 90 Turkish troops, the equivalent of a company, have been stationed in the Gulf nation since 2015.The Turkish Parliament Foreign Affairs Committee, Proceedings, 4 May 2017.The minutes suggest that an additional joint training mission between the Turkish gendarmerie and Qatari internal security forces is soon to be realized. Ibid. The committee’s transcript clearly shows that the administration sees Qatar as a like-minded ally when it comes to Middle Eastern affairs, a fact that is shown by the responses of diplomats and military bureaucrats to the committee’s MPs.Ibid.Besides, the proceedings reveal that in late 2017, Turkey and Qatar will hold a third joint strategic committee meeting, headed by the Turkish president and the Qatari emir.Ibid.The initial vanguard of the Turkish deployment might be completed before the joint committee meeting. So far, political rhetoric from both sides show that both Ankara and Doha will do their best to shield the forward base from the ongoing Gulf crisis’ political turmoil. Without a doubt, the most important article in the defense cooperation deal is that which allows Turkish troops to be stationed on Qatari soil, as it underpins Turkey’s ability to establish a forward military base in the Gulf. However, contrary to speculation, the ratified defense deals do not provide for a casus foederis,For the full text of the treaty, see: http://www.resmigazete.gov.tr/eskiler/2015/06/20150608-1-1.pdf, Accessed on: 22 June 2017.a diplomatic clause determining the circumstances under which the military alliance will be initiated, such as NATO’s Article 5. Turkey is therefore not legally committed to defending Qatar should it be attacked. Unlike the Turkish-Qatari agreement, the Turkish-Azerbaijani defense partnership has open-ended clauses that could well be interpreted as casus foederis in times of war.ABC AZ, http://abc.az/eng/news_22_12_2010_50349.html, Accessed on: 22 June 22 2017.On the other hand, although some analysts have labeled Turkey’s forward basing in Qatar as ‘symbolic’,Al Jazeera, http://www.aljazeera.com/indepth/features/2017/06/analysis-turkey-deploying-troops-qatar-170607174911372.html, Accessed on: 7 July 2017.this term is overly vague. Even the Turkish exclave in Syria, which is centered on the historical tomb of Suleiman Shah and guarded by a ceremonial watch squad, led to such events as a Turkish evacuation incursion.CNN, http://edition.cnn.com/2015/02/22/middleeast/turkey-syria-tomb-rescue/index.html, Accessed on: 7 July 2017.In the case of Qatar, this refers to thousands of men in uniform operating a joint forward base, which goes far beyond a gesture of merely symbolic importance. Indeed, it reflects Ankara’s broader geopolitical vision. As discussed by this report, Turkey’s forward military deployments are an integral part of Ankara’s defensive posture and strategic calculus in the 21st century. By garrisoning military forces from the Eastern Mediterranean to the Horn of Africa,Anadolu Agency, http://aa.com.tr/en/africa/details-emerge-of-turkish-military-base-in-somalia/664139, Accessed on: 22 June 2017.Turkey has been expanding its sphere of strategic influence. The Turkish forward presence in Qatar goes beyond ‘simple’ military balance issues. It was established in a bid to project a whole new level of political influence and military force. When Ankara agreed with Doha to establish a significant military base in 2015, some experts assessed that Turkey was aiming to complement its ability to project soft power in the Gulf with hard power capabilities. According to this view, a permanent deployment would anchor the Turkish-Qatari strategic partnership in an unpredictable and rapidly changing regional security environment.Galip, Dalay. “Türkiye Neden Katar’a Askeri Üs Kuruyor?”, Al Jazeera Turk, http://www.aljazeera.com.tr/gorus/turkiye-neden-katarda-askeri-us-kuruyor, Accessed on: 22 June 2017.Besides the American forward deployments centered on al-Udaid, the presence of Turkish troops provides for much greater regime security for the Qatari emir. At the same time, this means Turkish will have more of a hand in Gulf affairs. From the outset, some Turkish commentators went so far as to portray the establishment of a military base in Qatar as a return of the Ottoman imperial territories lost following the First World War.TRT Avaz, https://m.youtube.com/watch?v=u2eGigAVeRU, Accessed on: 9 July 2017. Turkey’s military base in Qatar will prove a central pillar of the nation’s foreign policy well into the 2020s. As indicated earlier, according to open-source information, a brigade-level joint force (a few thousand troops from all branches of the Turkish military) will be stationed in Qatar.Olivier Decottignies and Soner Cagaptay. “Turkey’s New Base in Qatar”, Policy Watch 2545, the Washington Institute for Near East Policy, January 2016.This could constitute a regional game-changer. Although not an overly significant component of the Turkish armed forces’ active manpower, the possible deployment of a brigade – amounting to about 3,000 Turkish troops – is tantamount to a third of Qatar’s active military personnel, exceeding the total firepower of the Qatari navy and air force.For detailed data, see: IISS, Military Balance 2017, Routledge, London, 2017.Thus, within the limits of bilateral agreements between Ankara and Doha, the base would play an important role in shaping Qatar’s defense planning. Notably, defense partnerships not only concern military hardware transfers or troop deployments, but also give rise to political-psychological bonds. The Turkish-Qatari defense partnership covers comprehensive training projects, which could foster the training of a new generation of Qatari troops highly familiar with Turkish strategic culture. By the 2030s, a considerable number of Qatar’s generals could be fluent Turkish speakers and skilled operators of weapons Turkish platforms, nurturing a deeply rooted operational affinity with troops deployed by Ankara. Parallels might be drawn with the impact of the Syrian Arab Army’s familiarity with the Soviet military establishment on current Syrian-Russian military cooperation. Thirdly, the military base’s profile is highly significant. Once completed, it will include elements from all branches of the Turkish military, as well as Turkey’s elite Special Forces, the Maroon Berets who played a critical role in Operation Euphrates Shield. In other words, the Turkish base will provide Ankara with several strategic options ranging from a port at which to dock its navy to the deployment of tankers and AWACS aircraft, similar to the US’ use of al-Udaid. The fast-track parliamentary ratification transformed Turkey’s role in the Gulf crisis from a potential mediator into a regional stakeholder.The New York Times, https://www.nytimes.com/2017/06/07/world/europe/turkey-qatar-support.html?_r=0, Accessed on: 22 June 2017.It demonstrates that Ankara saw its strategic ties with Doha as an indispensable part of Turkey’s geopolitical agenda, one which should be preserved from diplomatic fluctuations. Crucially, Turkey’s decision to deploy troops in Qatar was not conceived as an anti-Saudi move but one supporting Qatar. In this respect, the Turkish Foreign Office’s official statement on the issue conveyed Turkey’s ‘sincere wishes to the Gulf Cooperation Council members to solve their differences of opinion and approach through dialogue’.For the press release, see: Ministry of Foreign Affairs, http://www.mfa.gov.tr/no_-175_-5-june-2017_press-release-regarding-the-developments-among-saudi-arabia_-united-arab-emirates_-bahrain_-egypt-and-qatar.en.mfa, Accessed on: 22 June 2017.When compared to contemporary Turkish diplomatic rhetoric, such statements bespeak sobriety and restraint. As seen during the recent political escalation with Europe, Ankara is not afraid of using strong rhetoric to pursue its interests. In the Gulf crisis, Turkey’s stance reflects a desire to avoid conflict among such key strategic partners as Qatar and Saudi Arabia. Although such priorities might appear normative, they should be interpreted as part of a shift towards a realpolitik-oriented foreign policy which Ankara learned through its experience during the Syrian civil war. Yet a central question arises: in the event that the situation further escalated, to what extent could Ankara maintain its pro-Qatari stance without riling Saudi Arabia? After all, the removal of the Turkish base was among the Arab Gulf nations’ list of demands transmitted to Qatar, revealing uneasiness among GCC countries concerning its presence in the region. Maintaining good relations with the Kingdom is vital – Saudi Arabia is the region’s top military powers. Turkish officials are also keen to sell arms and equipment to the Royal Saudi Navy. The Undersecretariat for Defense Industries (SSM), Turkey’s official procurement body, was laying the groundwork for a deal involving the sale of MILGEM corvettes,Defensenews, http://www.defensenews.com/articles/sources-turkey-to-ink-largest-ever-export-deal-for-local-industry, Accessed on: 22 June 2017.which would have considerably increased Turkish defense exports. Thus far, Turkey’s harsh rhetoric has been targeted, focusing on the United Arab Emirates (UAE) rather than Saudi Arabia. While President Erdogan called for the Saudi mediation to the crisis as the biggest Gulf nation,Daily Sabah, https://www.dailysabah.com/diplomacy/2017/06/22/president-erdogan-saudi-king-salman-agree-to-increase-efforts-to-end-tension-in-gulf, Accessed on: 10 July 2017.the Turkish administration and press sources accused the UAE of supporting the failed coup attempt in Turkey in July 2016 by funneling $3bn to those carrying out the putsch.Daily Sabah, https://www.dailysabah.com/politics/2017/06/13/uae-allegedly-funneled-3b-to-topple-erdogan-turkish-government, Accessed on: 10 July 2017.This difference reflects Ankara’s wish to clarify its opposition to the Emirates’ unflinching, anti-Qatari stance as well as the importance of shielding Turkey’s relations with Saudi Arabia. The Turkish administration’s decision to send troops appears to have won over Qatari public opinion. Analysis of social media suggests that Qatari reactions to the impending deployment have been universally positive, lauding the two countries’ fraternal ties through such hashtags as #ThankYouTurkey (شكرا_تركيا#) while remarking on how the diplomatic crisis has shed light on whom Qatar can rely upon with #IveLearnedFromTheSiege (تعلمت_من_الحصار#). Similarly, Qatari media agencies have made much of the number of posters of both President Recep Tayyip Erdogan and Qatar’s emir Sheikh Tamim bin Hamad al-Thani adorning cars and walls throughout the peninsula, citing their profusion as proof of domestic support for Turkey’s intervention.Yenisafak, http://www.yenisafak.com/en/world/erdogan-posters-receive-great-interest-in-qatar-2716628, Accessed on: 22 June 2017.Moreover, photographs of imported Turkish products sent to replenish Qatari food stocks, labelled on shop shelves as ‘From Turkey by Air’, made the rounds on social media as evidence of Ankara’s munificence.https://twitter.com/taxi3201/status/873612110374342656, Accessed on: 22 June 2017. Sheikh Tamim went so far as to express his gratitude to the Turkish president online, thanking him for bringing succor in Qatar’s time of need. The crisis occurring during Ramadan has shaped perceptions of Turkey’s support. Many posts praising Erdogan’s backing Qatar include the hashtag #Ramadan (رمضان#), recognizing the symbolic resonance of coming to a food-deprived ally’s aid during the holy month. On July 15th, which marked one year since Turkey’s failed coup attempt, many users went so far as to draw parallels between the putsch and the ‘siege’ imposed on Qatar. Some expressed hope that the boycott would fail just as the coup had,https://twitter.com/majedalansari/status/886125936235642881, Accessed on: 18 July 2017.while others noted how media outlets that had supported the failed overthrow of the Turkish government were the same as those backing the Saudi-led boycott.https://twitter.com/search?q=%D9%82%D8%B7%D8%B1%20%D8%AA%D8%B1%D9%83%D9%8A%D8%A7%20%D8%AD%D8%B5%D8%A7%D8%B1&src=typd&lang=en, Accessed on: 18 July 2017. The Turkish parliament’s ratification of further troop deployments in Qatar risks sparking a backlash across countries at the forefront of the Qatar embargo. The reaction in Saudi Arabia is of particular importance in light of the kingdom’s central role in orchestrating the diplomatic crisis. On June 8th, al-Riyadh and Okaz, two of Saudi Arabia’s foremost newspapers, published scathing op-eds criticizing Turkey, while Saudi news website Ajil claimed to have unearthed documents proving Doha and Ankara colluding in order to ‘destabilize Arab countries’ referring to so-called evidence that both states had planned to topple Muammar Gaddafi.“Saudi newspapers attack Turkey after its decision to send troops to Qatar - (Suhuf sa’udia tuhajim turkia ba’d qarariha nashr quwat fi qatar)”, Arabi 21, 8 June 2017, Accessed on: 22 June 2017. Amal Raslan, “Secret Qatari documents unearthed: Doha and Turkey planned to involve Arabs in toppling Gaddafi - (Watha’iq qataria sirria takshif: al-doha khatatat ma’ turkia li tawrit al-‘arab fi isqat Al-qadhdhafi)”, al-Youm al-Sabaa, Accessed on: 22 June 2017.In the span of several hours following the Turkish parliament’s vote, Saudi social media users criticized President Erdogan and the Turkish Government. Purportedly in response to Ankara ignoring the boycott by delivering goods to the peninsula, tens of thousands of Saudi Twitter users expressed their support for a campaign aiming to encourage their countrymen to identify and boycott Turkish goods, restaurants, companies and workers.“Saudi campaign for the boycott of Turkish goods (Hamla sa’udia li muqata’at al-muntajat al-turkia)”, Almarsd Online Newspaper, 8 June 2017, Accessed on: 26 June 2017.Similar initiatives were launched in the UAE and Egypt. Petitioners implored the director general of the Saudi government’s customs division, Ahmed al-Hagbani, to impose a formal ban on Turkish goods in reaction to the pro-Qatar line held by Turkish media agencies.“Saudi campaigns demands the boycott of Turkish products in response to Turkey’s alignment with Qatar (Hamla sa’udia tutalib bi muqata’at muntajat turkia raddan ‘ala inhiyaziha li qatar)”, Erem News, 8 June 2017, Accessed on: 23 June 2017. Notably, there have been signs that Turkey may have failed to square a tricky diplomatic circle. Arriving in Ankara on June 10th – hot on the heels of Iranian Foreign Minister Javad Zarif – Bahrain’s Foreign Minister Khalid bin Ahmed al-Khalifa announced that Turkey’s base in Qatar serves to protect the entire Gulf and is not ‘targeting anyone in particular’,,“Bahrain: the Turkish military base in Qatar’s purpose is to ensure security in the Gulf - (Al-bahrein: qa’idat turkia al-‘askaria fi qatar hadafuha himayat ‘amn al-khalij)”, Alkhaleej Online, 10 June 2017, Accessed on: 26 June. 2017.an indication that GCC countries would likely hold off from openly opposing the arrival of Turkish military support. Yet it was not long before opposition to Ankara’s move came to a head: the list of demands sent by Saudi Arabia, the UAE, Bahrain and Egypt nearly two weeks later explicitly required that Qatar shut down the Turkish military base. Although the demands have been dropped, 26th June saw Bahrain’s foreign minister to describe the Turkish troop deployment as ‘a military escalation for which Qatar will bear the consequences’.“Bahrain's FM in about-turn over Turkish base in Qatar”, Al Jazeera, 27 June 2017, Accessed on: 14 July 2017. The UAE may prove less complacent regarding the prospect of a greater Turkish military presence in the Gulf. Abu Dhabi and Ankara eye each other with mistrust, their foreign policy aims being diametrically opposed. Doha’s support for the Muslim Brotherhood, an issue at the heart of the diplomatic spat, is harshly condemned by the Emirati government. As the only other regional power vocal in its support for the organization, how Turkey’s intervention is perceived is shaped by the degree to which different countries are opposed to the movement. Whether GCC countries are ready to countenance Turkey’s stepped up troop presence in Qatar will largely depend on their attitude towards Brotherhood-affiliated groups. As the only GCC state which has consistently remained fundamentally opposed to the Muslim Brotherhood – prior to the crisis, Saudi Arabia had appeared to be taking steps towards normalizing relations with the organization since mid-2015“Saudi King Welcomes Youssef Qaradawi and Rachid Ghannouchi In Mecca- Saudi Designation Of Muslim Brotherhood Appears Dead In The Water”, The Global Muslim Brotherhood Daily Watch, 11 July 2016, Accessed on: 14 June 2017.– the UAE is unlikely to let up in its objection to the presence of Turkish troops in Qatar. Under Mohammed bin Zayed, the federation has proven intransigent in its refusal to allow the organization to operate within its borders. From combatting armed groups with Brotherhood ties in Libya and Yemen to financing Egypt’s crackdown on their members, the UAE’s foreign policy is grounded in a singular determination to combat the movement, a task whose importance has surpassed even that of curbing Iranian geopolitical ambitions. The Emirati elite are therefore likely to see the impending deployment of Turkish troops in Qatar as highly threatening. It is worth noting that although Saudi Arabia issued a statement affirming its solidarity with Erdogan and the Turkish people within the hour following last summer’s failed coup attempt, the UAE waited 16 hours before releasing a similar statement.“How has Turkey increased its opposition to the UAE after the Gulf crisis? - (Kayfa sa’adat turkia fi mawqifiha did al-imarat ba’d al-azma al-khalijia? )”, NoonPost, 13 June 2017, Accessed on: 22 June 2017. The Emirates have openly voiced their disapproval of Turkey’s troop deployment.“The UAE: Qatar’s request for help from Turkey and Iran opens a new chapter in the crisis - (Al-imarat: talab qatar al-‘aun min turkia wa iran yaftah faslan jadidan fi al-azma)”, Turk Press, 8 June 2017, Accessed on: 23 June 2017.The severity of its criticism of Qatar’s reaction to the crisis is rivaled only by Egypt. Anwar Mohammed Qarqash, the UAE’s minister of state for foreign affairs, tweeted that Qatar will not benefit from falling back on Turkey, adding that ‘the crisis with the brother is rendered all the stranger by those who stand by him’.Ibid.During a subsequent visit to Paris on June 19th 2017, he stated that Qatar’s isolation ‘could last for years’, going on to say that the UAE would refrain from further escalating the situation, preferring to wear Doha out through attrition.“The UAE: Qatar’s isolation could last for years (Al-imarat: ‘azl qatar qad yastamir sanawat)”, Almogaz, 19 June 2017, Accessed on: 22 June 2017. As in Saudi Arabia, support for boycotting Turkish products, companies and employees is ubiquitous throughout Emirati social media. Mohammed Khalef al-Habtoor, chairman of one of the UAE’s biggest conglomerates and known for voicing his opinion on foreign policy issues, took to Twitter to express his opposition to Ankara’s troop deployment, urging his fellow citizens to back a ban on Turkish goods.“This is what Emirati billionaire Khalef al-Habtoor had to say about Turkey’s support for Qatar - (Hakadha ‘allaq milliardir imarati khalaf al-habtur ‘ala da’m turkia li qatar)”, Erem News, 10 June 2017, Accessed on: 22 June 2017.The UAE’s particularly strong stance against Turkey’s involvement (and for the ‘siege’ imposed on Qatar) has sparked a slew of criticism doled out by Qatari media outlets and social media – Al Jazeera has run a story on accusations that the UAE has spent $3bn in a bid to oust President Erdogan during the attempted coup of 2016.“A writer: the UAE has spent three billion dollars on backing the Turkey coup - (Al-imarat anfaqat thalathat milliarat li da’m inqilab turkia)”, Al Jazeera, 14 June 2017, Accessed on: 26 June 2017.Analysis purely based on Emirati social media must, however, be taken with a grain of salt. Seeing as the UAE’s attorney general has declared sympathizing with Qatar online a punishable offense, any Emirati social media users backing Qatar will have refrained from voicing their views. Similarly to the UAE, Egypt has not taken kindly to Turkey’s support for Qatar. Widespread criticism of Ankara’s decision to send troops has stemmed from both the government as well as internet users. The al-Sisi regime, having overseen the ruthless suppression of groups linked with the Muslim Brotherhood, is fundamentally opposed to the consolidation of a Turkey-Qatar alliance. The Egyptian President has notably called for Saudi Arabia and its allies to expand the siege imposed on Qatar to include Turkey.“Al-Sisi proposes to expand the siege on Qatar to include Turkey - (Taqarir: al-sisi iqtarah tawsi’ hisar Qatar li yashmal turkia)”, Daily Sabah, 15 June 2017, Accessed on: 23 June 2017.From the outset, Egyptian users of social media were among those most opposed to Qatar’s resistance in the face of the initial boycott – they make up the largest share of the 400,000 names listed on an online petition condemning Doha’s defiance.“The campaign against Qatar: we gathered 400,000 signatures against the Tamim regime and Egypt had the highest number of votes (Hamlat muqata’at qatar: jamma’na 400 alf tawqi’ did nizam tamim.. wa misr al-a’la taswitan)”, Al-Youm al-Sabaa, 19 June 2017, Accessed on: 23 June 2017. Egyptian media has accused Qatar and Turkey of seeking to mete out revenge on Egypt for having backed Doha’s diplomatic isolation, with news organizations transmitting accusations that Turkey has asked Qatar to stoke the flames of the Saudi-Egyptian territorial dispute over the islands of Tiran and Sanafir.“A new satanic plan (Khita shaytania jadida)”, Al-Youm al-Sabaa, 16 June 2017, Accessed on: 22 June 2017.These allegations have been taken up by social media users, who accuse Qatar of spreading fitna – dispute and unrest among believers – in a bid to turn Riyadh and Cairo against each other.https://twitter.com/5a1di/status/875010611087855618, Accessed on: 20 July 2017.A number of accounts (both Egyptian and Saudi) have claimed that Turkey is taking advantage of Qatar’s vulnerability, selling it goods at a marked-up rates. Photos originally used to display the ‘From Turkey by Air Sign’ are used to draw attention to the sale of yoghurt for 18 riyals, ostensibly six times its original price. The F15 deal: a green light from Washington? Reactions to Qatar agreeing to purchase 36 F15 fighter jets from the US for $12bn have varied considerably. Many Qataris hailed the move as a clear signal from the American government following the confusion that arose from US Secretary of State Rex Tillerson’s position on the crisis – effectively a call for the blockade on Qatar to be eased – being seemingly undercut by the US president during a press conference held less than an hour later. On social media, Qataris celebrated the F15 deal as definitive proof of the Trump administration’s support, presenting it as a turning point in the diplomatic crisis. A Qatari ex-football player with a large Twitter following declared it ‘the straw that broke the camel’s back’.https://twitter.com/mohdalsuwaidi7/status/875157213169549312, Accessed on: 20 July 2017. As a whole, Saudi and Emirati users responded negatively to the deal’s announcement. A number of Saudi accounts falsely claimed that the F15 deal was agreed upon during Obama’s presidency, hinting that it in no way reflected a shift in Washington’s position towards Qatar.https://twitter.com/Adhwan/status/875547834065580032, Accessed on: 18 July 2017.Others cast the agreement as a threat: a journalist working for the Saudi al-Riyadh newspaper tweeted that the planes would be put under Iranian control.https://twitter.com/DrHamsheri/status/872984180992421888, Accessed on: 20 July 2017.But Al-Ittihad, the Emirati newspaper with the widest circulation, argued that the deal was of little consequence as Qatar lacks sufficiently trained pilots to put the new planes to good use.“Qatar is not a military threat: it is only trying to put an end to its isolation - (Qatar laysat muhadada ‘askarian.. faqat tuhawil al-iflat min halat al-‘uzla)”, Al-Ittihad, 18 June 2017, Accessed on: 20 July 2017.Despite these attempts to minimize the sale’s perceived impact, the US’ continued willingness to ignore the Saudi-led embargo and do business with Qatar has strengthened Doha’s hand, reducing the risk of tensions escalating. Current reactions are interesting to compare to those in response to the military cooperation agreement through which the base was established in 2015, signed in the wake of Baghdad’s refusal to allow Turkish troops to be stationed in Iraq. Saudi Arabia reportedly welcomed the deal as a means of countering Iran’s regional influence. However, with Abu Dhabi concerned at the coming together of two pro-Muslim Brotherhood powers, the agreement was ‘not viewed positively’ in the UAE.Paul Cochrane, “Revealed: Secret details of Turkey's new military pact with Qatar”, Middle East Eye, 27 January 2016, Accessed on: 18 July 2017.That said, while Emirati newspaper The National noted that ‘political differences’ with Ankara remain, it was not critical regarding the creation of a Turkish base in Qatar.Taimur Khan, “GCC and Turkey find common ground to rebuild relations”, The National, 24 May 2016.It is likely that, in the midst of the renormalization of regional political relations following the 2014 Qatar crisis, Saudi approval for the Turkish base prevented the voicing of any significant opposition on behalf of the UAE. Media outlets outside the Gulf struck a more critical tone. Al-Youm al-Sabaa, an Egyptian newspaper, argued that the move to host Turkish forces was part of Qatar’s strategy to use foreign bases to further their ‘dirty’ political goals in the region.Youssef Ayoub, “Is Qatar a country protected by foreign bases? (Qatar dawla tahmiha al-qawa’ed al-‘askaria al-ajnabia? )”, al-Youm al-Sabaa, 18 December 2015.In the same vein, an article on Jordanian news website JO24 contended that Egypt and Gulf States should feel directly threatened by the Turkish base, with Riyadh confronted by Ankara’s desire to cast itself as leader of Sunni Islam.“Hidden Gulf concerns regarding the Turkish military base in Qatar - (Al-qalaq al-khaliji al-khafi min al-qa’ida al-askaria al-turkia fi qatar)”, JO24, 18 February 2016.By and large, however, the creation of a Turkish base on the Qatari peninsula was not criticized by most Gulf States. That its establishment could not have gone ahead without the US’ tacit approval will have doubtless decreased the likelihood of a united front emerging against the military cooperation deal signed between Doha and Ankara. Moreover, this highlights the fact that current tensions regarding the deployment of Turkish troops stems not so much from the prospect of Ankara’s involvement in the region, but rather its support for Qatar during the diplomatic crisis. Throughout the current Gulf crisis, Ankara has chosen to compartmentalize its policies, adapting its rhetoric to its relations with the various boycotting states. While the Turkish administration has been harsh in its comments vis-à-vis the UAE, it has consistently sought to strike a softer tone with Saudi Arabia in a bid to keep the peace with the region’s foremost power. With the list of 13 demands calling (among other conditions) for the Turkish base to be closed dropped by the boycotting nations, this multi-track approach to regional diplomacy already may have borne its fruit. The base will confer to Turkey a range of military advantages. From forward homeporting for its navy to the ability to deploy an air force contingent, the move to better anchor Turkey’s military presence in the peninsula boosts its capacity to project force throughout the Middle East. In addition, stronger strategic ties could lead to the emergence of a new, pro-Turkey generation within the Qatari security apparatus. Maintaining a joint brigade-level expeditionary force would represent a considerable defense burden on Turkey. Yet it is clear that Ankara, upon weighing the costs and benefits, has deemed that its geopolitical interests in Doha trump other political and military considerations. Strong allies in a region of shifting sympathies, the Qatari and the Turkish governments’ close relations are grounded in the similarities that unite their positions on regional issues. As a result, Turkey will continue to stand by Sheikh Tamim as he weathers the ongoing crisis. Since Doha’s armed forces are constrained by their limited manpower, Qatar relies on its status as a host-nation to ensure its security. Thus far, both the American-manned al-Udaid Base and the troops deployed under CENTCOM (which have proved crucial in facilitating Operation Inherent Resolve) have helped the Gulf nation guarantee its survival in a hostile environment. By hosting a second military contingent from a key NATO state, the Turkish deployment allows Qatar to hedge its bets and avoid relying solely on the US. Alongside its bases in Somalia, Cyprus, Syria, and Iraq, Qatar’s will be Turkey’s fifth forward strategic outpost. Although the Saudi-led coalition’s demand for the Turkish base to be shut down has been removed, Ankara’s assertive foreign policy remains an important parameter among different Arab nations’ public opinions. Analysis of social media throughout the countries pressuring Qatar has shown that public opinion and media agencies have reacted unfavorably to Turkey coming to its ally’s aid. That said, a look at reactions in 2015 shows that the Gulf States currently against the Turkish base did not condemn its initial established, suggesting that their opposition to current troop deployments is more the product of circumstance than of a deep-rooted aversion to Turkey adopting a more assertive military role in the region. 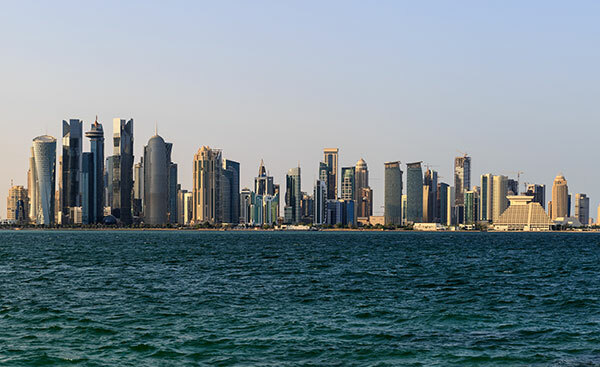 Conversely, recent Qatari social media activity has been overwhelmingly positive, with the peninsula’s citizens expressing gratitude at their ally’s largesse. The base is part and parcel of Turkey’s desire to increase its strategic clout: when coupled with a decade of successful defense modernization, Ankara’s ability to deploy forces from the Mediterranean to the Persian Gulf will further enhance its international influence.